If you’re traveling in northern Laos and you’re looking for a fun way to connect with a local community, check out Big Brother Mouse. Based in Luang Prabang, a popular stop on the Laotian tourist beat, this non-profit literacy organization offers drop-in English tutoring twice a day, seven days a week, for Laotians who want to improve their English. And it’s not just the students who drop in. Travelers are encouraged to stop by and help with a two-hour conversational English session. You don’t need to sign up in advance and you don’t need any teaching experience. Just show up and chat. They’re happy to have you. Big Brother Mouse’s tutoring center in Luang Prabang also has bilingual Laotian / English children’s books for sale. I stopped in one afternoon when I was traveling in Laos a couple of months ago. I was one of two volunteers at that session so we split into two groups. My group consisted of seven teenagers, all of whom spoke basic English. Some were there just to chat. Others came with homework questions or for help with essays they were writing. “I want to practice my English and get a better job,” said Por Xiong, a high school student who had only been learning English for seven months, but conversed quite well. He practiced as much as possible, he told me, attending Big Brother Mouse’s free tutoring sessions several times each week. Sally Robinson from Liverpool, England, was my co-tutor on the afternoon I visited. She has also volunteered as an English teacher in Cambodia. It was an intense but fun couple of hours as the students bombarded me with questions about grammar, the United States, world travel, and anything else they could think of. They told me about their homes, their schools, and their families. I learned a lot about everyday Laotian life and the world view of average Laotian teenagers. Travelers with a bit more time and cash can also sponsor a “book party,” a one-day cultural exchange in which they travel to a school in a rural village and spend the day chatting with students, reading stories with them, playing games, and donating low-priced, bilingual (Laotian and English) books to a community that can’t afford such materials. It costs around 300 US dollars to sponsor such an event. Sponsors can travel with the organization to a rural village school within an hour or so of Luang Prabang, and spend the day with anywhere from 30 to 100 students. Each student receives a book at the end of the day. Extra books are donated to the school to start a library. Siphone Vutthisakdy wrote “The Cat that Meditated” for Big Brother Mouse. Children’s authors are welcome to donate manuscripts. Stories that are accepted are translated into Laotian and illustrated by a volunteer artist. The books that were available, he added, tended to be bland textbooks. They had no illustrations and were not appealing to younger kids, so reading was not presented as a fun activity. The purpose of the book parties is to change that, and to get books into the hands of kids whose families or communities cannot afford them. Vutthisakdy has written a book of folk legends for the center. “I heard a lot of stories from my grandparents so I picked four stories I liked the most,” he said. 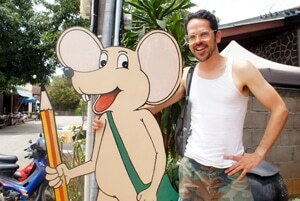 His book, “The Cat that Meditated, and Other Stories” is one of more than 200 titles available through Big Brother Mouse. Their books are sold at the center in Luang Prabang, the Luang Prabang night market, and at another Big Brother Mouse shop in Vientiane, the Laotian capitol. “Most schools in Laos, they learn just what they see in the textbook but they never touch real things,” Vutthisakdy said. At the Discovery Days, students might handle lava rocks, or take apart and then re-assemble a radio so they understand how it works. Lue Thor and Her Vang attend Big Brother Mouse tutoring sessions several times each week. I had a fun couple of hours teaching English when I visited. The students asked if I’d be back the next day. Unfortunately, it was the last day of my trip in Laos and I had to return home to Singapore in the morning. “See you later, alligator,” my new friend Lue said as he headed out with his buddy, Her. “Are you guys brothers?” I asked. 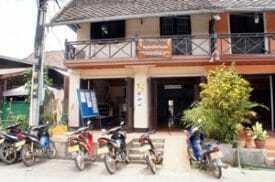 If you’re passing through Luang Prabang and are interested in tutoring, they have sessions every day from 9 to 11 a.m. and 5 to 7 p.m. You’ll find full details, including their location, on their website at bigbrothermouse.com. The website also has more information about how to sponsor a book party or “Discovery Day.” If you can’t attend in person but wish to sponsor an event through a donation, they’re happy to send you photographs of the day.